Paul Jarvis remains one of the most dangerous attacking full-backs in the Championship despite suffering several potentially career-ending hamstring injuries over the last 15 months. The Doncaster Knights star bagged the award for the club’s try-of-the-season last term following a superb 75m individual effort, which saw him get the better of a number of defenders, against Leinster A in the B&I Cup. 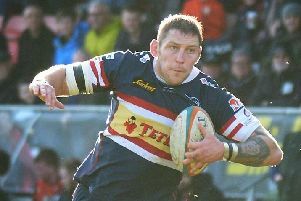 Jarvis made his eagerly-awaited return to action in the last home game against Coventry in the club’s inaugural Championship Cup game at Castle Park – though dual-registered Cameron Cowell has proved a more than adequate replacement – and wasted little time in showing his talent for spotting a gap. He started on the bench in last Friday’s win at Nottingham and hopes to feature more prominently in Saturday’s Championship Cup game against Yorkshire Carnegie. The game is being played at the home of National Two North side Hull Ionians due to work being carried out on Carnegie’s Emerald Headingley Stadium which they share with Super League giants Leeds Rhinos. “It seems strange to not be playing Carnegie at Headingley, where we haven’t had the best of records over the years, but hopefully it will help us pick up a result this weekend,” said Jarvis. Saturday’s game is the first of three games between the two clubs before the end of the year – Carnegie visit Castle Park on Saturday week in the return cup game and also travel down the A1 just after Christmas on the resumption of the league programme. “They haven’t made the best of starts to their league campaign but they’ve had a lot of injuries,” said Jarvis. “I think that they are trying to put a team together during the group games in the cup with a view to kicking on and moving away from the foot of the table when the Championship starts up again. “We will also be looking to pick up a win so it will be a massive game for both clubs. “Although both teams will be looking to win on Saturday I think the two cup games will be a sort of ‘finding out process’ and will be good for analysis, but when it comes to the league game I think it will be a different type of game. “Both teams will be using the six cup games to build momentum and a good team culture and get some good rugby under their belts. We certainly are. “It’s a bit of a strange situation to be playing a block of six successive cup games but at the same time it gives us the opportunity to work on different things without having the pressure of having to pick up points in the league every week. “We still want to win the cup games, and obviously we are pleased to have won both our opening games. But the competition also gives us the freedom to try things that we might normally hold back on in the league.